A 34-year-old woman presented after recovering from a disseminated Coccidioides immitis infection of the lungs, blood, brain, and placenta. The patient was asymptomatic for visual complaints. Visual acuity was 20/20 in both eyes. Fundus examination demonstrated bilateral chorioretinal infiltrates worse in the left eye. 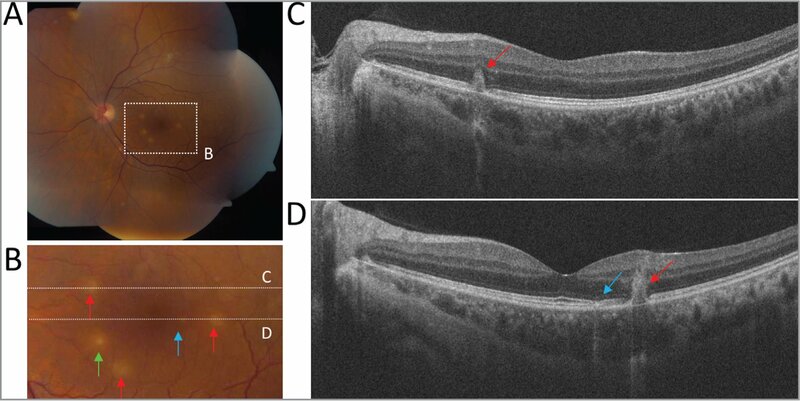 Fluorescein angiography (FA) was unable to be performed as the patient was breastfeeding, prompting the use of optical coherence tomography angiography (OCTA) imaging to further investigate the infiltrates. OCTA imaging was able to detect all visualized chorioretinal infiltrates and showed an additional non-visualized deep choroidal lesion. OCTA is a valuable tool in detecting chorioretinal lesions when FA is contraindicated. Coccidioidomycosis, also known as Valley Fever, is caused by either Coccidioides immitis or C. posadasii, which are dimorphic saprophytic fungi that are endemic to dry desert regions.1 Human infection occurs after inhalation of fungus, although most patients remain asymptomatic or have a mild respiratory illness.2 Although pulmonary infection is the most common clinical manifestation, lymphatic and hematologic dissemination can occur in 1% to 3% of patients, with skin, bone, joint, and central nervous system having the most common manifestations.1 Ocular involvement is rare, but coccidioidomycosis-related retinitis, iridocyclitis, and endophthalmitis have been previously reported.3–8 Typically, the diagnosis of ocular coccidioidomycosis is difficult and requires appropriate clinical context and direct visualization of lesions.8 Optical coherence tomography angiography (OCTA) enhances our ability to evaluate and characterize chorioretinal abnormalities.9 We herein report the OCTA findings in a patient with coccidioidomycosis chorioretinitis. A 34-year-old woman was referred to the eye clinic for bilateral chorioretinitis. The patient remained visually asymptomatic and denied any significant ocular history, medications, ocular trauma, or surgery. Her medical history was notable for recent pregnancy and hospitalization for coccidioidomycosis-induced pneumonia, acute respiratory distress, and septic shock. During this admission, the patient underwent emergent cesarean section for severe maternal compromise with the diagnosis of Coccidioides septicemia made by placental histologic analysis (for acute necrotizing villitis), which demonstrated Coccidioides organisms. Blood cultures grew hyphae, suggestive of C. immitis with PCR corroborating C. immitis DNA. Disseminated disease was confirmed by Coccidioides spherules noted in her cerebrospinal fluid (from lumbar puncture) and pleural fluid (from thoracentesis). The patient was initially placed on parenteral fluconazole and amphotericin B and was transitioned to 200 mg of daily oral fluconazole as her clinical course improved. On presentation to our clinic, her best-corrected visual acuity was 20/20 in both eyes (OU) as measured by Snellen, and her intraocular pressure was 17 mm Hg and 18 mm Hg in the right eye (OD) and left eye (OS), respectively, by Goldmann applanation tonometry. The remainder of her anterior examination was within normal limits OU. Fundus examination demonstrated scattered punctate white infiltrates within the subretinal space and inner retina OU. The majority of lesions were localized to the periphery OU, but numerous discreet macular lesions were found OS (Figures 1A and 1B). There was no evidence of vitritis. Fundus imaging of left eye in coccidioidomycosis-associated chorioretinitis. (A) Fundus montage photo of posterior segment shows multiple peripheral chorioretinal lesions. (B) Macular region expanded from panel A allows for better resolution of central chorioretinal lesions. Dotted lines indicate retinal regions imaged by optical coherence tomography (OCT). (C, D) OCT imaging shows chorioretinal lesions disrupting choroidal and outer retinal architecture. Red arrows indicate lesions observed on fundus photography. Blue arrow indicates lesion not observed on fundus photography. OCT imaging of the macula OD revealed no abnormalities, whereas OS demonstrated scattered hyperreflective lesions in the outer retina with disruption of surrounding retinal architecture (Figures 1C and 1D). Fluorescein angiography (FA) was not performed as the patient was breastfeeding at the time. 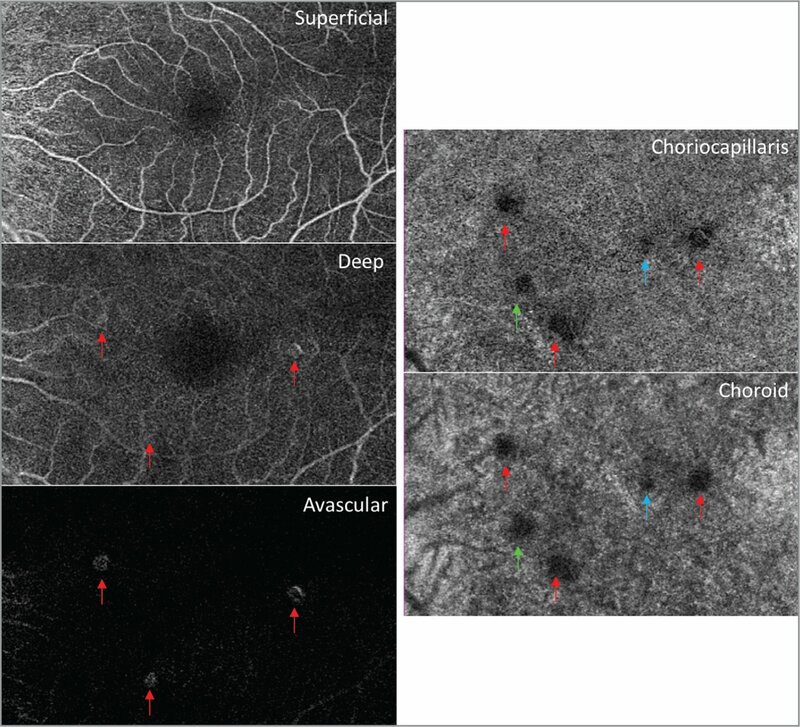 OCTA imaging OD was normal (data not shown), whereas OS demonstrated a total of five macular lesions as evidenced by areas of choroid and choriocapillaris dropout; however, three lesions penetrated into the deep retinal layers (Figure 2). Most importantly, one lesion was visible on OCTA but was not visible on funduscopy. Optical coherence tomography angiography (OCTA) imaging enhances detection of chorioretinal lesions. OCTA images indicate chorioretinal lesions within the macula are localized deep in the choroid and choriocapillaris with three lesions extending into the deep retinal layers (red arrows) and two lesions existing completely within the choroid and choriocapillaris (green and blue arrows), one of which was not visualized on funduscopic examination (blue arrow). To the best of our knowledge, this case report is the first to describe the ability of OCTA to evaluate coccidioidomycosis-associated chorioretinitis. Our patient demonstrated discreet chorioretinal infiltrates OU consistent with granulomas in the setting of confirmed systemic coccidioidomycosis. OCTA imaging was superior to direct visualization in detecting macular lesions that are both visible and not visible on funduscopic examination. The ability to directly visualize the superficial and deep capillary plexi and the choriocapillaris allowed for better delineation of the depth and extent of the infiltrates. Additionally, OCTA imaging was a safe and noninvasive alternative to FA, which was contraindicated in this patient. It is also possible that a FA would not have been able to identify the deep choroidal lesion given its poor choroidal penetration. Khairallah et al. recently reported on the superiority of OCTA over FA in a case of West Nile virus chorioretinitis and vasculitis.9 Moreover, the utility of OCTA imaging in diagnosis and monitoring of noninfectious choroiditis is increasingly being demonstrated.10 Although the disease is rare, our case highlights the utility of OCTA imaging in the management of coccidioidomycosis-associated chorioretinitis. The chorioretinal infiltrates are best visualized with OCTA on the choriocapillaris and choroid slabs, which show disruption and dropout of the normal vascular architecture. Hagele AJ, Evans DJ, Larwood TR. Primary endophthalmic coccidioidomycosis: Report of a case of exogenous primary coccidioidomycosis of the eye diagnosed prior to enucleation. In: Ajello L, ed. Coccidioidomycosis: Papers from the Second Symposium. Tucson, AZ: University of Arizona Press; 1967:37–39. From Byers Eye Institute, Department of Ophthalmology, Stanford University School of Medicine, Palo Alto, California. Address correspondence to Ryan A. Shields, MD, Byers Eye Institute,Department of Ophthalmology, Stanford University School of Medicine, 2452 Watson Court, Palo Alto, CA 94303; email: ras3@stanford.edu.